“How to retain the effects of imitation swiftlet sounds? Swiftlet are attracted to fresh new external sounds. That explains why when you turn on a fresh external sound, the number of swiftlets visiting your bird house increases, but after a while it may drop. In order to maintain its effect, installing an auto sound changer connected to a hexagonal tweeter is the solution. Pre-installed sounds can be set to automatically change with the pre-set intervals, e.g. weekly for every sound etc. 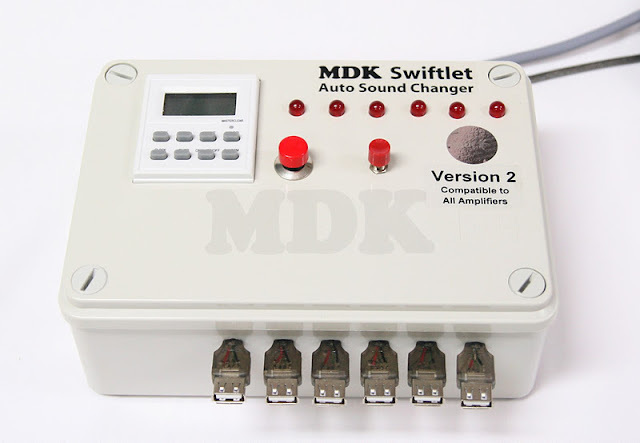 -We do supply MDK SWIFTLET AUTO SOUND CHANGER VERSION 3 which can switch the sounds RANDOMLY.